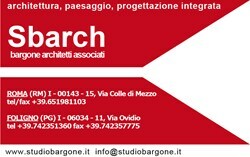 Architectural and landscape Studio, with offices in Rome and Foligno, founded in 2002 by Federico Bargone and Francesco Bartolucci, friends and schoolmates, together with Aroldo Bargone; other partners joined the Studio: Massimo Baldini in 2008, Enrico Auletta and Gianlica Pelizzi in 2012. The professional activity is based on the integration of specialistic and multidisciplinary competences. Through theoretical researches, practical experiences and participations in international competitions and workshops of shared architecture, Sbarch analyses the City dynamics, elaborates complex architectural and landscape projects, studies new approaches for urban and environmental regeneration and reorganization, applies sustainability study models and bio-climatic technologies. Sbarch has realized a series of pieces of architecture, winning numerous competition prizes, exhibiting its works in different exhibitions and publishing in different architectural magazines. They won the first prize for the extention of the University Campus ‘Rizzi’ in Udine, the new Interchange Railway Station ‘Vesuvio Est’ in Salerno, the Urban Requalification of the district ‘Oltretorrente’ in Parma, the New City Theatre in Verbania and in Ghedi, the Urban Requalification of the Gabelluccia district in Crotone. Federico and Francesco won the “EUROPE 40 UNDER 40” in 2009, prize to the EUROPE’S MOST IMPORTANT EMERGING YOUNG ARCHITECTS AND DESIGNERS given by the European Centre for Architecture Art Design and Urban Studies by the Chicago Athenaeum.